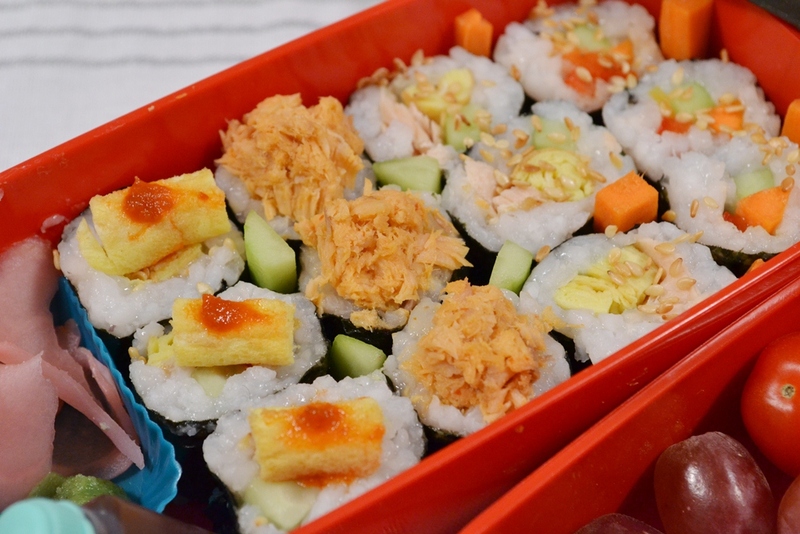 Sushi, part of a Bento box. The other day I posted on Facebook that I cooked Sushi rice and one of my friends asked me if I could teach her how to make Sushi. Since I wanted to make Sushi that night I decided to make a tutorial for all to see and share. Making Sushi is not that difficult, you will need some “helpers” of course but once you have them, or even substituted them it will be easy to make. However, plan to spend some time on it: cutting, preparing, cooking some ingredients will take some time. But you will love the result and your creativity knows no boundaries. I am a Sushi lover and making it at home at first seemed frighting but by now I have the hang of it. You will too, as with everything, it will need a bit of practice. 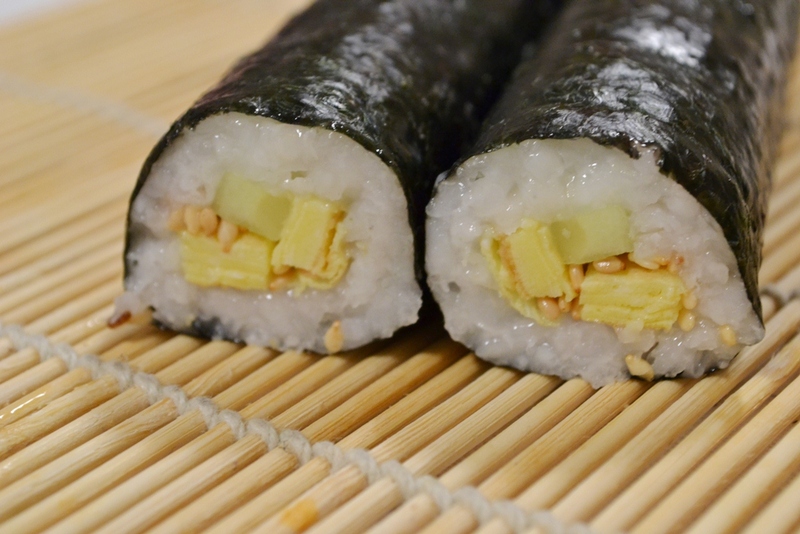 Egg, cucumber and sesame seed roll. 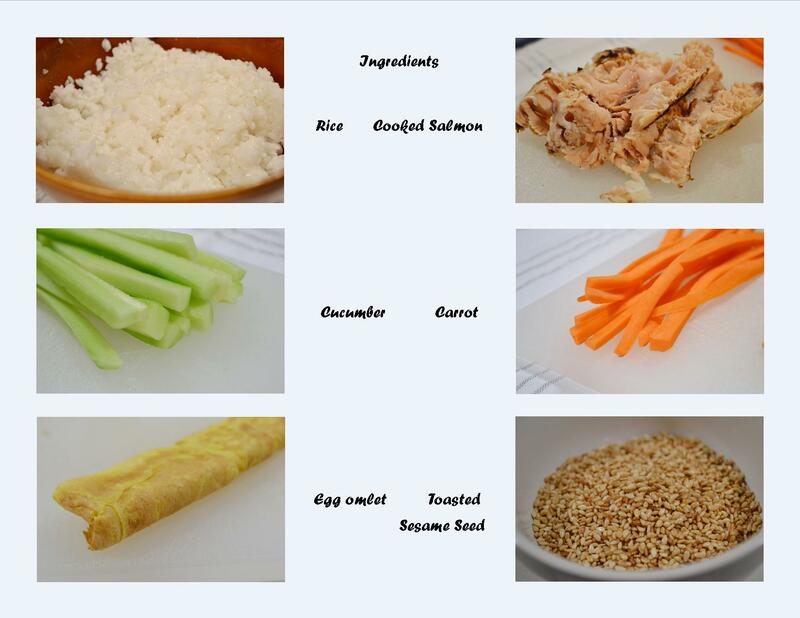 First you will need to cook the Sushi rice, which is different from normal rice because it sticks. Take 300g raw rice and rinse under cold water until the water runs clear. Put it into a pot and add 350 ml water and let it soak for about 10 min. Then turn on the heat on medium to high and let boil for 2 min while stirring. Reduce the heat to low and let simmer for 10 to 20 min, remove from the heat and let it sit for another 10 min. Combine 35 ml rice vinegar with 3/4 tsp. salt and 3/4 tbsp. sugar until dissolved. Transfer the rice into a cold stoneware bowl and add the mixture, carefully stirring. You do not want to squish the rice. Let cool before using. If you rice is glossy and shiny you did it right, if not do not worry it will still taste good. 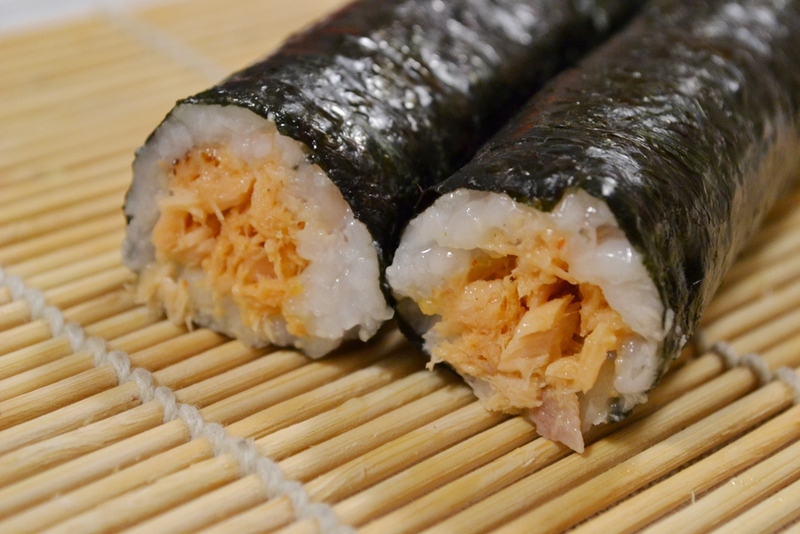 Cooked salmon with spicy sauce roll. Cut all your Sushi roll ingredients before hand which will make assembling easier. I like to have cucumber, carrot, bell peppers as basics. You can also use avocado, lettuce, spring onions, spinach, or pumpkin. For your protein you want fish, shrimp, calamari, omelet, beef, pork, or chicken. I prefer the fish based Sushi myself and do not include meats but other people might not like raw fish. 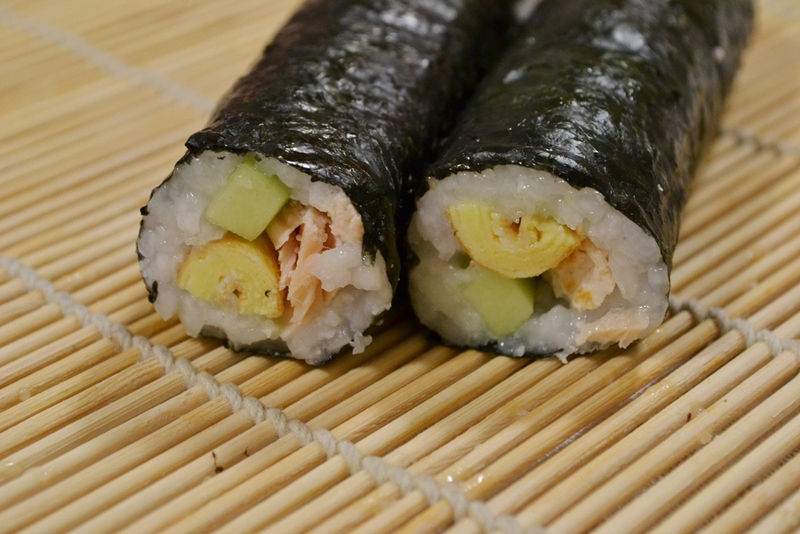 Egg, cooked salmon and cucumber roll. Tip 1: If you use raw fish make sure it is fresh. That means, if the fish smells like fish it is not fresh. If you buy a whole fish check the eyes, they should be clear, and the gills, they should be red. Buy the fish the day of making sushi, if you can’t avoid it you can buy the fish the night before. Keep it well refrigerated! Your ingredients should have the length of a Nori leaf, preferably. 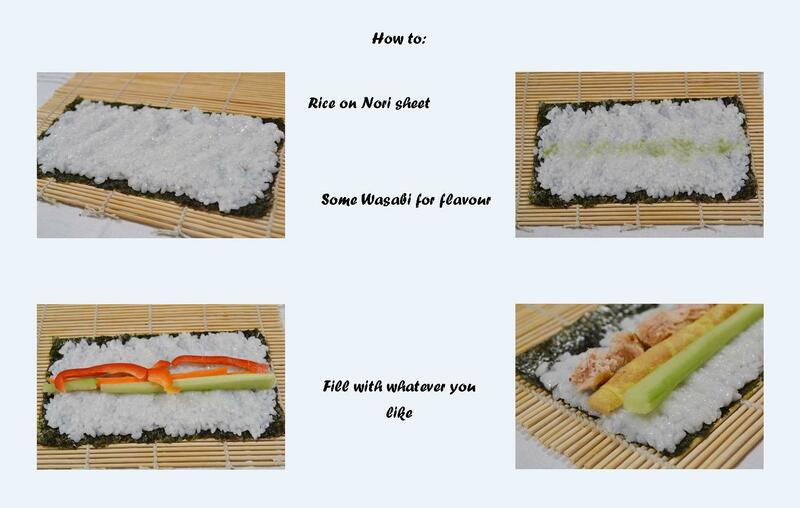 Cut your vegetables thin so that you will not overfill the Sushi roll. Same holds true for your meat and fish, have thin cuts so that you can fill the Sushi roll reasonably. Take one Nori sheet and divide it in half to make Hoso Maki (small Sushi rolls), a full sheet will give you Futo Maki (a big roll). Place the sheet on your bamboo mat so that the edges close up. Wet your hands with water and take a handful of rice and press it lightly onto the Nori sheet leaving a thing strip that has no rice. This part will later “glue” your roll together. Add a hint of Wasabi in one line onto the rice and start filling your roll. Anything you like goes: I made a cucumber, carrot, bell pepper roll first. This is also the easiest. Next, use veggies and fish, or veggies and egg, or only fish. To roll up: grab the long edge of the rolling mat and carefully start rolling, pressing slightly, making sure nothing falls out. Stop before you hit the strip of “no sushi rice” and wet that part slightly with water which will enable the “glue part”. Roll up and press lightly again. Making good looking rolls will take a few tries so do not worry about it. Maybe start with veggie fillings before using fish or more “expensive” ingredients so that if your roll does not close or doesn’t look too pretty it won’t be so bad. For you to know: She uses Korbu while cooking Sushi rice. That is something similar to Nori, a seaweed for flavour. I don’t use that but you certainly can. Cut in half, cut in half again and you should end up with 8 total pieces. They are usually placed on a plate or platter with the rice side up but you can arrange them whichever way you like. If you want you can sprinkle some toasted sesame seeds over your rolls. Tip 2: Toasted sesame seeds are easy to make. Take a non stick pan, heat it very well WITHOUT any oil. Add the seeds and toss them slightly until brown. Let cool before using. 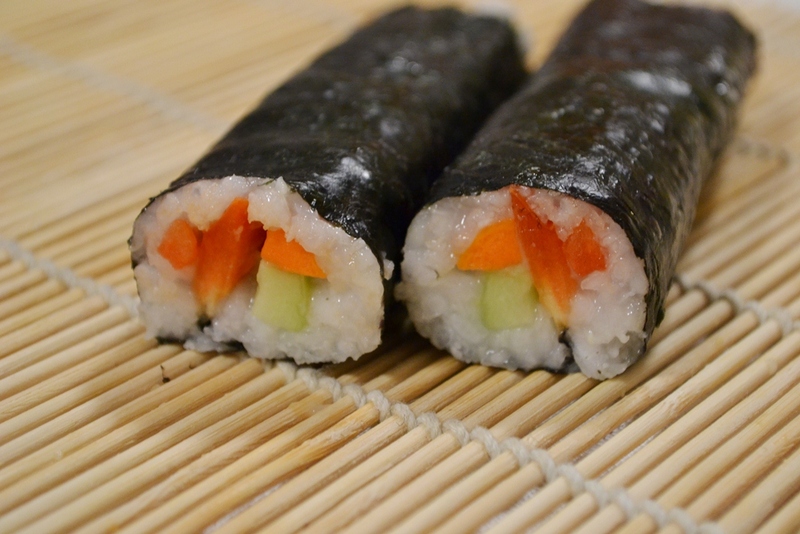 Simple cucumber, carrot and bell pepper roll. Now roll away and have some fun! Posted in Cooking and tagged cooking, fish, how to, Japanese food, Sushi. Bookmark the permalink. I’ve never made sushi before, and have been searching for a makisu for a while. Where did you purchase yours? And, where do you buy your nori and rice? my makisu came with a Sushi making book. It was a set and I received that as gift. Since I do not know where you live, it’s hard to say what is at your disposal. If you live in a bigger city, you probably have an Asian grocery store. They not just carry the sushi rice and nori, but also makisu. Depending on the grocery stores available to you, the local grocer might have nori and sushi rice as well. And if you can’t find a makisu, you can always use a tea towel. It’s a bit less sturdy but works too.